Cheltenham Festival tips: Will Cue Card defy Djakadam to land Gold Cup glory at last? Colin Tizzard insists he will be an impartial supporter of Native River and Cue Card when destiny comes calling in the Timico Cheltenham Gold Cup. Even in spite of Thistlecrack's enforced absence, the Dorset handler has long held the aces in the big race as his two runners remain towards the head of the market. But Tizzard has no preference for either horse on what will be the biggest day of his training career. 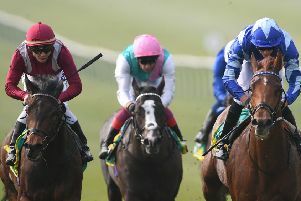 He said: "The handicapper says there is about 2lb between them and they know pretty much what is what. "I would not be able to split them and I would not mind if either jumps the last four lengths clear. "There is no way I would want one horse to win more than the other. "All I want is for both horses to run their races and come back fit and sound. "May the best horse win." Native River has been a revelation this season, with victories in the Hennessy Gold Cup at Newbury, the Welsh National at Chepstow and the Denman Chase at Newbury a clear testament of his quality. Eleven-year-old Cue Card suffered a heartbreaking fall in the Gold Cup last season, when bang in the hunt, but has showed no signs of slowing down this winter. "He won so strongly at Ascot last time and looks as well as he has ever been," said Tizzard. "Cue Card has done everything bar win a Gold Cup and we have everything to play for. "We thought his chance might have gone, but he has an equally good chance this year as he had last year." Djakadam has finished second in the last two renewals, but trainer Willie Mullins believes his preparation has gone much better than in previous years. "He hasn't had any setbacks this year," said the County Carlow handler, who has yet to win the race. "I think he's more mature this season and he's come to the age where you can win a Gold Cup. "We just need the ball bouncing in our favour a little bit more and it could happen. "It would be nice to win it." Jessica Harrington is especially wary of Djakadam when she saddles Sizing John, the Irish Gold Cup winner. Impressive Lexus Chase winner Outlander adds weight to the Irish challenge. Trainer Gordon Elliott said: "We decided to miss the Irish Gold Cup with him. "People know I'm not afraid to run my horses, but we just thought it was the right thing to do. "He's probably surprised me a bit. He's a horse at home that doesn't do anything too fancy." Elliott's compatriot Henry de Bromhead goes to war with Champagne West, who has been in fine form this year and is also a two-time course winner. Bristol De Mai was well beaten by Native River at Newbury last month, but trainer Nigel Twiston-Davies felt there were extenuating circumstances. Trainer Jonjo O'Neill and owner JP McManus won the race with Synchronised in 2012 and are double-handed with Minella Rocco and More Of That. Paul Nicholls hopes last month's Kelso scorer Saphir Du Rheu can outrun his big odds. Trainer Alan King said: "It's going to be very tough for the old boy but he has been an absolute superstar." Lizzie Kelly will be the first female jockey to ride in the Gold Cup since 1984 when she receives the leg-up on Tea For Two, while Irish Cavalier has also been declared by Welsh trainer Rebecca Curtis.